Create a set of stuffed animals: monkeys, giraffes, and rabbits. Toys can be painted red, green, or blue. Describe the makeup of the set (animals or colors) with fractions. 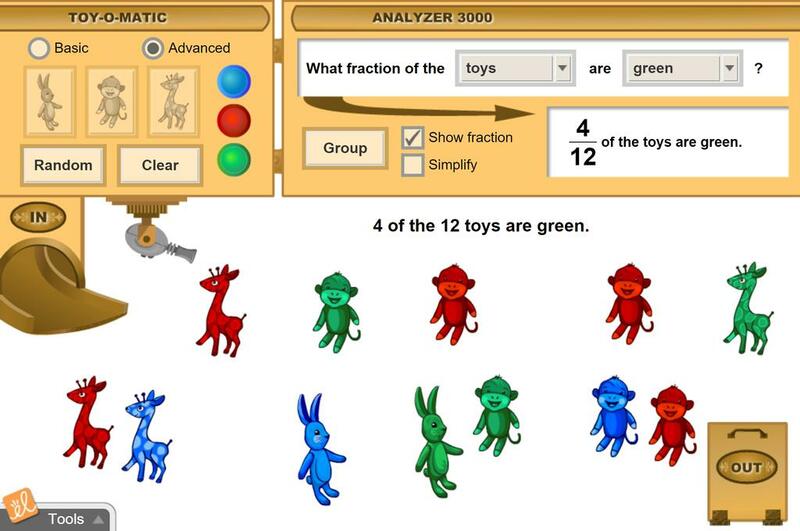 Arrange the toys into groups to simplify the fractions. Understand that a fraction shows the relationship between a part and a whole. See that the denominator represents the total number of equal parts in a whole. See that the numerator represents the number of parts being referred to. Use visual models to connect what fractions mean with how fractions "look." Learn that a fractional part of a group can be represented by two (or more) equivalent fractions. This document is intended to support students in constructing explanations in math utilizing the claim, e... (more)vidence, reasoning framework for talk and writing. This activity is suitable for learning support students who have difficulties with language and understan... (more)ding the concept of fractions. It is designed for a synchronous online lesson with a small group of students using visual models to connect what fractions mean with how fractions "look." My students really engaged with this Gizmo. I love that they can demonstrate their understanding for me to see online.